They sat there stuffed into a small room. So many of them leaned their heads back with their eyes closed. They all seemed tired and unenthused about the worship music we had practiced so hard for them. But then I heard God say so clearly…Descansa (rest). As I listened to God telling me that these people were resting, my focus changed. We continued singing and I watched as tears fell from the eyes of many. Few were singing, few were standing…all of them were resting in the Spirit. 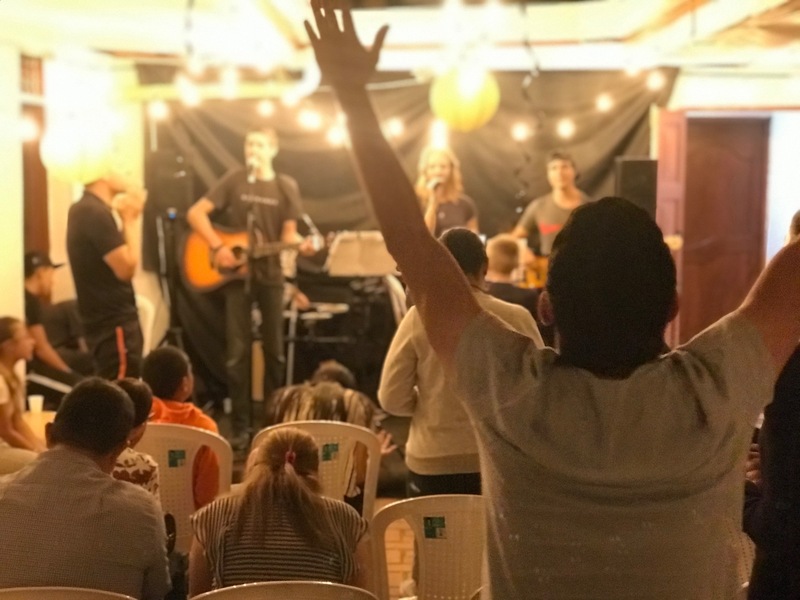 When God called our ministry to begin a Vertical Worship room here in Colombia, we seemed at a loss for what that actually meant. What most of us are used to is Horizontal Worship. The focus of Horizontal Worship is to please the audience. Time and effort are spent choosing songs that the congregation will enjoy, and the songs typically have a theme that coordinates with the sermon of the week. There are a specific amount of songs and they are timed precisely around announcements, greeting time and the sermon. Many churches have found growth and success in this form of worship. We started the Vertical Worship room knowing that we wanted to draw others to the presence of God every time we performed a song. We desired to make worship a time to really listen and react the way the Holy Spirit was guiding us. The first few weeks we had practiced our 10 songs and played them flawlessly within the allotted time. People were beginning to fill our small space and we were excited about the encouragement we were receiving from locals that were attending. One Friday evening as we were spending time in prayer as a team, we were asked to take 30 minutes during worship in which the pianist would play a melody while we took time to listen to the voice of God. We were to sing and play as the Spirit led. This was new territory for all of us and would really require faith that the Holy Spirit would guide us. I especially needed to trust that God would send me the correct words in Spanish. Our piano player began a melody the rest of us hadn’t heard before…and then the words came to me. The guitarist played the exact chords as the piano and we worshiped. We had never played or practiced this song before, but it felt as thought we had played it multiple times in the past. This song wasn’t meant for those who were crowded into the space…this song was us communicating directly with God. Every week we desire to communicate with God in a closer and closer capacity. We are hosting a space where people come “where they are at” and have the freedom to stand, sing, dance, lay down, and do whatever they need to hear from The Holy Spirit. To Him be the all the glory! If you would like more info on the Vining family and their ministry, Click Here!